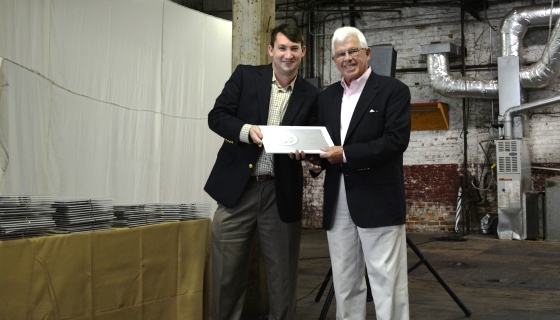 At the annual meeting of the MISSISSIPPI HERITAGE TRUST in Tupelo Mississippi this past June, Ernesto Caldeira, the co-author of THE PLANTATION WORLD OF WILKINSON COUNTY 1792-2012, received the prestigious Preservation Education Heritage Award on behalf of his co-author Stella Pitts and himself for their all-volunteer effort in writing and publishing the 325 page full color hard cover book covering eighty local plantations, their families, their furnishings, and their history. The proceeds are all to be donated to aid the preservation efforts of the Civic Club. We had five exciting antiques shows from 2007 to 2011. Lots of people had lots of fun going to them! Civic Club President David Wilkerson and Elizabeth Smither Wilkerson. We depend on our show volunteers like Paul and Mary Ann Stevens from St. Francisville who open the show every year as they welcome visitors on Friday. The father and son team of Brian Baldwin and Bill Baldwin from Ruston will be with us again in 2011 . . .for their 5th year. Sisters Charlen Simmons and Caress Simmons Baldwin with their mom Teresa Simmons. Woodvillians and life-long friends Sue Stockett Nicholas and Martha Kee Hewes. Friends get to see each other unexpectedly . . . this time it was Capt. Clarke Campbell Hawley . . "Doc" is the legendary steamboat captain; and Queen of Proteus Catherine Smart Favrot whose Mom is a Brandon from Woodville; and the Historic New Orleans Collection Development Director Jack Pruitt. Our long-time friend Michelle Weaver Jones is with the Mississippi Department of Archives and History and her husband W. Brian Jones . . he was our architect for the restoration of our African American Museum building in 2004 and they live in Starkville and join us every year. Natchez preservationists Sherry Jones and Cindy Bailey haven't missed a show!